China's censors are finally catching up to WhatsApp. Unlike most Western media platforms, including its parent company Facebook (FB), the popular encrypted messaging app had managed to escape the attention of Chinese officials. Now it's firmly on their radar. 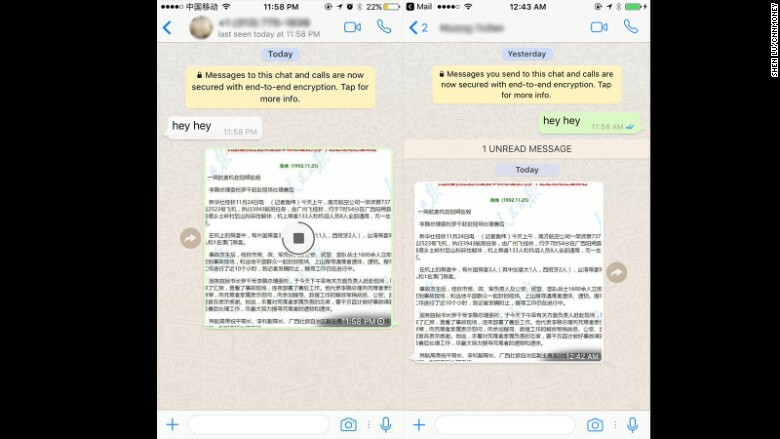 Left: An image appears to be loading on a Chinese WhatsApp user's screen. Right: The image took nearly 13 hours to reach the recipient in the U.S.
A WhatsApp spokesperson declined to comment when reached by CNNMoney. The Chinese government did not immediately respond to a request for comment. China has tightened internet censorship across the board in the run-up to the Communist Party's 19th Congress this fall, where a major senior leadership reshuffle is expected. A new cybersecurity law that took effect in June is expected to make it harder for foreign firms to operate in China. "The combination of the new cybersecurity law, and the upcoming Party congress, in addition to restrictions on unregistered VPNs, all point to this being a concerted government effort to crack down on freedom of expression," said Peter Micek, general counsel at digital rights organization Access Now and a teacher of internet policy and governance at Columbia University. A wave of politically sensitive news appears to have prompted an increase in Chinese censorship in recent weeks. In the wake of the death of Liu Xiaobo -- a prominent Chinese Nobel Peace Prize laureate and human rights activist -- last week, censors blocked people from posting the image of an empty chair to pay tribute. The Nobel committee put Liu's medal on an empty chair in the 2010 award ceremony because he was still in prison. CNN's broadcast was blacked out in China every time Liu's images or story appeared. Smith, of GreatFire, believes the WhatsApp crackdown is primarily linked to the activist's death. "Censors are working overtime, trying to eliminate all information about him. They must have determined that Chinese were using WhatsApp to share pictures and videos of him and decided to crackdown," he said. Last week, images of Winnie the Pooh were also reportedly censored on Chinese social media because internet users were comparing the cartoon bear to President Xi Jinping. On Weibo (WB), China's equivalent of Twitter (TWTR), no results appear on searches for "Winnie the Pooh and Xi Jinping." China has 731 million internet users, and 95% of them access the web on mobile devices, according to data from the China Internet Network Information Center. Western media and tech companies have been trying to crack the market for decades but have largely failed. Facebook (FB), Google (GOOGL), Instagram, Twitter (TWTR), Snapchat (SNAP) and YouTube are among the Western services blocked in China. The crackdown has given domestic companies such as Baidu (BIDU), Youku, Sina (SINA) and Tencent (TCEHY) a huge advantage. Experts say WhatsApp's appearance in the government's crosshairs may also be aimed at helping a local competitor -- Tencent's WeChat. 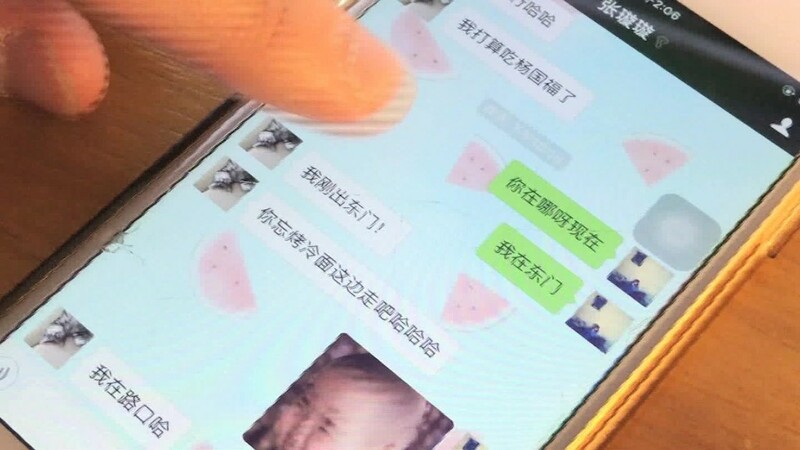 Unlike WhatsApp, WeChat is unencrypted and thus far easier to monitor. "The point of these attacks is to coerce the Chinese audience into using more open systems such as WeChat," Kobeissi said. This week's disruption suggests the risk of a full-fledged ban is rising. "A complete block is just a natural progression," said Smith. "Then gradually people will shift to WeChat."